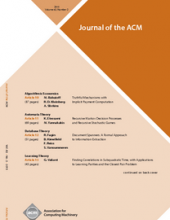 The Journal of the ACM ( JACM ) provides coverage of the most significant work on principles of computer science, broadly construed. The scope of research we cover encompasses contributions of lasting value to any area of computer science. To be accepted, a paper must be judged to be truly outstanding in its field. JACM is interested in work in core computer science and at the boundaries, both the boundaries of subdisciplines of computer science and the boundaries between computer science and other fields. Submissions to JACM is done electronically through http://mc.manuscriptcentral.com/jacm.